A grassroots movement is gaining traction in its efforts to battle climate change. 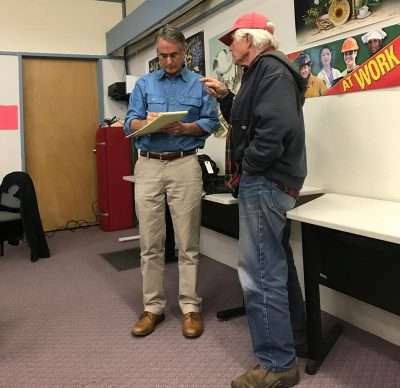 Members of the Citizens’ Climate Lobby covered a number of topics related to climate change — including the link to an increased severity of wildland fires — during a presentation at the Quincy Library on March 28. It was their seventh stop in a 10-city tour that included meeting with the editorial board of the San Francisco Chronicle. One of the presenters, Gordon Gregory, spoke of fire devastation firsthand as his house was one of the few homes spared during the Camp Fire that devastated Paradise last November. The Citizens’ Climate Lobby is supporting bipartisan legislation that has been introduced in Congress, which is designed to reduce the amount of CO2 emissions, which it deems as responsible for climate change. “Our bill causes a 90 percent reduction by 2050,” said Jerry Hinkle, one of the presenters. Hinkle described the bill as an efficient, low cost solution, and effective. The money collected from the carbon fee would be “allocated in equal shares every month to the American people to spend as they see fit.” The program costs would be paid from the money collected. There also would be a border carbon adjustment — imported goods would have to pay a fee and those exported would receive a refund. There were local leaders in the room to hear the presentation including Plumas County Supervisors Lori Simpson and Michael Sanchez, as well as Portola City Councilman Bill Powers. 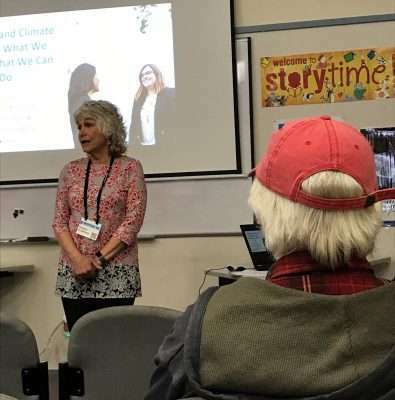 Portola resident Robbin Anderson welcomes those gathered at the Quincy Library for a presentation on climate change and its relationship to wildland fires. Anderson is a congressional liaison for the Chico Chapter of the Citizens’ Climate Lobby. Sanchez said that quick action was needed to reduce the fuels in the forests if local communities were to be protected. The group is hoping to gain the backing of individuals and local government entities. They are hopeful that the communities of Chico and Oroville would pass resolutions in support of the bill and their work. Hinkle and Gregory are private citizens who lobby on behalf of the Citizens’ Climate Lobby as is Portola resident Robbin Anderson, who organized the Quincy presentation. All three said that climate change must be addressed to protect the planet for the children and grandchildren. Anderson said that youth are doing their part and referenced the Schools for Climate Action effort. To find out more about Citizens’ Climate Lobby go to citizensclimatelobby.org. Who is Citizens’ Climate Lobby? Q. What’s the actual science behind global warming? A. The earth radiates some of its heat out to space naturally, but certain gases — “greenhouse gases” — trap a portion of this heat radiation. Carbon dioxide, CO2, is an important greenhouse gas. Even at a very low concentration, CO2, has a powerful effect on the earth’s temperature. If there was no CO2 in the atmosphere, we would freeze, but just a little is enough to sustain life. For about 10,000 years, the CO2 level was quite steady, giving us a stable climate in which to live and grow. But when we discovered all the things we could achieve with fossil fuels, we started burning them at an accelerating rate. Burning those fuels converts carbon that’s been buried for millions of years into CO2 that is steadily building up. Scientists discovered the greenhouse effect in the 1850s, but it wasn’t until 1858 that we were able to measure CO2 in the atmosphere and measure how fast it increases. As of May 2018, it had climbed from 280 to 410 parts per million. That amount of CO2 accounts for about half of the follies carbon we’ve burned in modern times. What happened to the rest of it? Most of it has gone into the ocean, causing the water to become more acidic, which is detrimental to important marine life. Human activity, mostly fossil fuel burning, currently adds over 1,000 tons of CO2 per second to the atmosphere. Natural cycles? Volcanoes? The sun? These have all been ruled out. They are either too small, too slow, or going in the opposite direction. It’s us.